It’s the second day of August, which means there are only 19 days left of summer vacation for my kiddos. Which means only 19 days left until I have to start packing lunches every day. And this year, I’ll be packing two of them. I’m prone to geek out over lunch packing gear, namely adorable bento boxes and accessories that I can’t seem to stop buying (read: New Year, New Gear: My Lunchbox Game Plan). But I confess to falling into lunch ruts, packing the same items over and over until my son sheepishly confesses that he’s bored out of his mind. This year, I vow to do better–and get him more involved in the process. 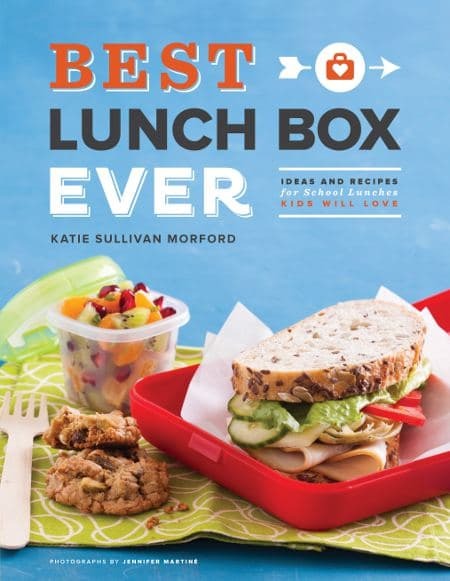 That’s why I’m so grateful for Katie, the mom behind Mom’s Kitchen Handbook, and her new book Best Lunch Box Ever. It’s a useful and adorable guide to lunch packing, loaded with tips and recipes that will make the year easier and yummier for you and your wee ones. Katie even made a short video about the book (watch it here) that will seriously make you want to start packing lunches right this very minute! 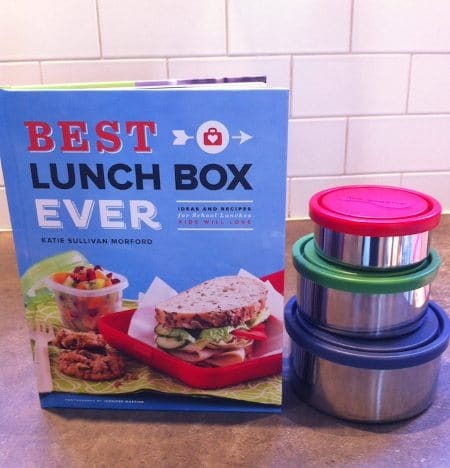 The winner of this giveaway will receive a copy of Best Lunch Box Ever and a set of three Kids Konserve stainless steel lunch containers (total retail value: $47). 1. Leave a comment at the end of this post telling me your biggest lunch packing challenge. 2. For an additional entry, LIKE Real Mom Nutrition on Facebook here AND Mom’s Kitchen Handbook here, then leave me another comment telling me that you did. Oh, and then there’s the grand prize. Let’s pause a moment to drool over the grand prize, shall we? The folks a Dacor have teamed up with Katie to give away one Dacor Distinctive Gas or Electric 30″ range (value: more than $3, 000!). To enter, use the form below by clicking “ENTER TO WIN”. 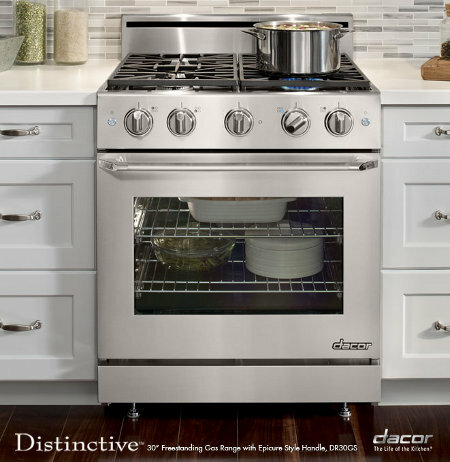 You can earn extra entries by clicking “easy entry for all Dacor fans on Facebook” and following Dacor on Twitter. These giveaways end Friday August 23 at midnight Eastern Time. U.S. residents only, please. Disclaimer: I received a copy of Best Lunch Box Ever. My biggest challenge is the guessing game of whether my kids are going to eat like birds or have huge appetites! My biggest challenge in packing school lunch for my 5-year-old daughter is keeping the menu diverse, fun, interesting AND something she will eat! Special diets – gluten free, dairy free & http://www.feingold.org can be challenging, but are SO worth it. My children are not picky eaters, but we do eliminate artificial ingredients & the previously mentioned foods from our menus. My biggest challenge is no fridges or microwaves! My biggest lunch challenge is finding a healthy variety of combinations that my 5 yr old daughter will actually eat! She’s very picky. And I liked you both on Facebook! This will be my first year packing lunches! I’m excited but I’m sure the challenge will be figuring out what my 5yo will actually eat! My biggest challenge is packing healthy lunches with variety. EVERY. SINGLE. DAY. My daughter is starting kindergarten this fall and I know variety will be a big challenge so she doesn’t get bored with her lunches. Also, she has a severe nut allergy so I am very nervous about keeping her safe. I have to make a lot of foods like granola bars from scratch because of her allergies. It’s worth it, but it is time consuming! My biggest challenge when packing lunch for my boys is coming up with ideas that are both quick to pack and healthy. It would be so easy to throw a bag of chips, a Little Debbie snack cake, a juice box, and a sandwich in their lunch boxes, but I want to find them healthy alternatives that will fuel them all day, not give them a sugar rush for an hour or two. My biggest challenge is variety and keeping hot things hot. I have one child always up for anything, and one child who wants the same meal everyday, cut exactly the same way. I like both of those pages on facebook. Packing lunch for peanut-butter-loving kids in a nut-free school! Liked Real mom nutrition on FB! I have liked Mom’s Kitchen Handbook, and I have had your page for quite a while! My biggest challenge packing for my selective eater. It has been awful packing lunches for him. Always the same thing, and most times the lunch comes home uneaten. 🙁 I have considered many different lunch ideas, none of which he will even look at never mind eat. Even some of the things he will eat at home, he will not eat in his school lunch. I dread another year of him going through the school year without eating. I have had many phone calls from school telling me he hasn’t eaten and is shutting down in the afternoon. So, I would welcome some fresh ideas, and hopefully make this year a little more appetizing for him…. Liked Mom’s Kitchen handbook on FB! My biggest concern with lunch is my son needs foods that are easy to eat with one hand. He had a brain tumor at 13 months old and lost the use of his right arm. He needs containers that are easy to open and foods that don’t require 2 hands to eat. Che is going into 3rd grade so he wants to be more independent. our big kid is starting kindergarten later this month and my biggest challenge is that i have no idea how to make her lunch *and* her milk fit into her little bag and stay cold all the way until lunch time. Biggest challenge: alternative to sandwiches! I already like you.. Lol .. But liked Moms kitchen too..
Love the stainless steel! Didn’t know there was such a thing and was worried about packing lunch this year for my 1st grader. We are GF, CF and try to be low in sugar and low in processed foods. Making lunch different and interesting is my biggest obstacle. Liked Real Mom Nutrition months ago and the other one today, both on FB!!! Thanks for your pages, they are great. My biggest challenge is packing healthy items that will still be fun so my kids will want to eat it. They eat great at home but at school I think they get junk food envy from their friends’ lunches. I also like you both on Facebook :). My biggest lunch challenge is variety! My biggest challenge is not giving in to peer pressure (or perceived peer pressure) with regards to lunches. The kids are different – they don’t use ziplock bags, they don’t just get a sandwich with chips, carrot sticks, apple, and cookies. I’m constantly being told things about the kids’ lunches – interesting, creative, unique – and there have been times when kids wanted to move away from my kids because they didn’t like the smell of the lunch (can we say curry!). We keep moving forward, but sometimes it’s hard to continue to be different. My biggest lunch challenge is packing a lunch on field trip days. That’s when I can’t use the soup thermos and I can’t use ice packs – limiting the choices to just shelf-stable foods. My biggest challenge is keeping the kids happy with healthy choices when their friends have many junky treats in their lunches all the time. Already liked Real mom Nutrition. Now I am a fan of Mom’s Kitchen Handbook also. It’s so easy to get into the rut if packing a pb&j (or some other sandwich) every day. I try to change it up with non-sandwich options but they aren’t always the bigger hits. My biggest challenge with packing school lunches would be adding enough variety. I already followed you on Facebook and now I like Mom’s Kitchen Handbook, also. My biggest lunch packing challenge is finding food that my picky eaters will actually eat. Every day entire lunchboxes come home – full – and then I’ve got a couple of cranky, hungry boys! Already liked RMN on FB and just liked MKH. My biggest lunch box challenge is variety. I rotate about three things. I get tired of it, I’m sure my daughter does too! I already like RMN and just liked MKH! Thank you!! I love all the great posts! Packing variety everyday while making sure it’s dairy & nut free. It’s all new to me this year, but I imagine that my biggest challenge will be a child who gets distracted by all the fun in the lunchroom and doesn’t eat enough to fuel him for the rest of the day. That book looks awesome, thanks for offering this giveaway! Consistency is my biggest challenge! Keeping hot foods hot and cold foods cold is my biggest challenge! My biggest challenge is packing healthy lunches for my youngest who is allergic to dairy, and possibly peanuts. And she hasn’t gotten her molars yet, so it has to be somewhat soft and mushy. Biggest challenge is packing lunches for three kids every day and making sure each gets the right food! My biggest lunchbox challenge is variety plus the battle of “why can’t our lunches be like everybody else’s lunch?” Like everybody else, we are busy and I often find myself running out of ideas or simply feeling like all my creativity has been lost! I sometimes just wish someone could tell me what to buy and what to fix and then I feel like that is half the battle! Thank you. I have already liked both FB pages as well. Liked both and thanks for the giveaway! Honestly, my biggest challenge is myself. I think my kids need plenty of variety, when to be fair, they would eat PBJ every day. I like you on FB. Thanks for the great giveaway. My oldest wants to try more of a finger food lunch, without bread, and my hubby keeps picking on me for looking at Bento-style boxes. I also liked Mom’s Kitchen Handbook on FB too. I love having new resources to pull inspiration from for my meals. my biggest challenge is having a very picky eater with texture issues. And I already like Real Mom Nutrition on FB, but I just liked Mom’s Kitchen Handbook! My biggest challenge is assembling a lunch that my daughter enjoys. She just started preschool and she doesn’t like sandwiches. I have stayed home with her this past year and all of our lunches have been warm food. While her preschool will warm up her food, I would like to find other alternatives that she would enjoy that don’t involve being microwaved. Also, she is really distracted having lunch with so many little kids, that she walks the room asking what other kids are having, all the while not eating her food. I liked your FB page and also the MKH page. My biggest lunch challenge is boredom. I get in ruts too! My biggest challenge is deciding what to pack for my unpredictable 3 year old eater. I already follow you on fb, and I just liked Katie’s page. Would love to win this giveaway! I liked and my biggest challenge is keeping everything warm. I find myself packing the same things – creating a variety of food choices seems to be difficult. I haven’t made daily lunches for a few years. But when I was packing them for my oldest daughter’s day care my biggest issue was keeping the containers clean and finding the lids everyday! Also incorporating veggies that she would eat. Liked both pages! 🙂 my daughter’s of to kindergarten this year. Sorry of wish I had another year before needing these items! My biggest challenge isn’t packing different things; it’s getting my child to eat the different things I pack! She would be thrilled to eat the same. dang. lunch every single day of the week. I think it might be a social thing (all her friends do it…) rather than her own food preferences, which makes it even tougher; but maybe packing some really amazing stuff in her lunch with the help of Katie’s book would encourage her to branch out. Thanks! My biggest issue in packing lunches is not letting them get boring by doing the same thing day after day. My biggest lunch packing issue is that my 7 year old changes her mind on what she’ll eat for lunch every day. And doesn’t like pb&j or lunch meat. We’ve had to get very creative last year for first grade. I’m not looking forward to 2nd grade lunches :(. My biggest challenge is that I’ve never had to pack lunches before! My oldest of 3 is just starting out! Aah! My biggest challenge is keeping food cold so nothing spoils sitting in the school locker. I pack lunch for school every day, and found some great, easy-open containers last year, plus the regular Thermos stuff, but the equally great lunch box from last year is not in great shape, and I’m having trouble finding a lunch bag that [is not huge for my 6-year-old and] will close and still hold all of the containers. Frustrating! My biggest lunch packing challenge is three kids, ages 5, 7, and 9 and three completely different tastes. My family is just moving to San Francisco, and we are subletting a small apartment with a tiny kitchen while we find a more permanent place to live. I have been a pantry-based cook-from-scratch-er for years, and preparing anything without my own stuff in a tiny space is my serious challenge. My biggest challenge is getting the lunch to go out the door with him! 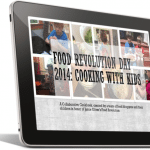 I liked Real Mom Nutrition & Mom’s Kitchen Handbook on Facebook. Biggest challenge! Packing a healthy lunch, that he says he wants & will eat, only to find he’s traded it OR threw it away & ate at school (our school has a website where I can see if he bought & what he bought). My biggest challenge is packing a variety of foods that my daughter will still eat. I can pack a great lunch, the challenge for me is the motivation to do it the night before when I actually have the time to do it well! My biggest challenge is getting my toddler to eat something other than peanut butter and jelly sandwiches. I’m past the lunch packing days! If I win I will pass the book on to someone who still has young kids. My biggest lunch packing challenge is trying to do something interesting 5 days a week. Definitely the biggest challenge is avoiding boredom…we tend to do the same things almost every day! Biggest challenge is trying to pack a variety of veggies. Biggest challenge: packing lunches for 6 kids, meeting their preferences, school requirements, my budget, and not driving myself insane! My picky preschooler will enter kindergarten this fall so this will be a new addition to our routine. Trying to avoid packing his favorite PB&J and baby carrots each day will be a challenge as well. My best lunch packing challenge is packing for field trips. I have to remember to pack for all conditions… and don’t forget to send wet wipes! I also like you and “Moms Kitchen Handbook” on Facebook and I follow both on Twitter. My biggest challenge is like the others finding things that my child will eat. He has food allergies, so that’s an added challenge. I’d love to win this prize for the recipes as well as the containers as clean containers are always in demand at my house. 🙂 I’ve liked the pages on fb and really hope to win! My biggest challenge is getting out of the turkey sandwich rut I always find myself in. My biggest challenge is ideas. It is a struggle every week to get a good balance with variety in their lunches – that they actually like. I have liked both you and Katie’s page on Facebook. Should I comment here or there? My biggest challenge is packing a peanut free lunch for my vegetarian/particular daughter. My biggest lunch packing challenge is figuring out what my picky eater will eat – it changes from day to day. My biggest challenge is that my daughter likes certain things just room temperature, but they have to be chilled to stay fresh. Thermos’ are too large for these small items – like beans. I also already liked Mom’s Kitchen Handbook and I liked you on FB now too! My biggest challenge is variety for my picky eater. Moving BEYOND the sandwich is my major lunch hassle! Can’t wait to get some new ideas!! My biggest challenge is figuring out nutritious, fast, easy things to put in my teen’s lunch. They’re conscience of what others say about their food and very picky! my biggest challenge is remembering to have things on hand for lunches. and I liked both pages! getting bored with the same old things. My biggest challenge is variety! 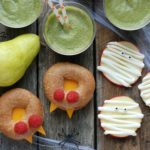 Biggest challenge – how to get protein (other than high-sugar kids smoothies) that my daughter will like and eat into her school lunches. I’d already liked RMN on Facebook, but now I liked Mom’s Kitchen Handbook as well. My biggest challenge is what to pack for my daughter. She won’t eat any sandwich except for peanut butter and fluff on white bread (with the crust cut off)! I’ve also tried yoghurt and cheese sticks, but they come home warm at the end of the day. Help! My biggest challenge is what to pack for my two high school girls. They like to bring their lunch, which is great, but it is hard to come up with different ideas that they like. Getting a variety of veggies in and not getting stuck in the sandwich rut day after day. Packing foods they will like and be able to eat in the short amount of time they have for lunch! Variety is my biggest challenge. Biggest challenge for me – trying to balance how much food to pack (it’s hard to predict appetites sometimes) and also being creative with nut-free lunches. My biggest challenge is finding healthy things that my daughter will actually eat – instead of her just leaving it in her bag – letting it spoil throughout the day, making me have to throw it away. I liked your page and MKH on FB. My biggest lunch challenge is dealing with a picky eater who doesn’t like sandwiches and changes her mind on foods she likes constantly. My biggest challenge is finding the right containers to use and not just resort to using plastic bags. My biggest challenge is finding more foods that can be eaten at room temperature and not resorting to sandwiches all the time. He’s only 5 but he’s super temperature sensitive and if the food was meant to be eaten hot but it’s not once he opens his lunch box, he won’t eat it! Drives me nuts! My biggest challenge is making sure my kiddos are getting nutritious foods that can compete with the poptarts and dingdongs in the other kids’ lunchboxes. Greatest challenge is definitely variety! We don’t eat meat, and I tend to pack the same peanut butter and apple, cheese stick, strawberries and grapes, etc kind of lunches! Thanks! our biggest challenge is NO dairy!! My challenge, like for others, is having variety. We do a lot of hot meals in a thermos, but need more ideas for cold lunches that can be prepared the night before. Biggest Challenge – dealing with a picky eater who only wants peanut butter and jelly or cold pizza. Everything else comes home either untouched or barely eaten. My biggest issue in packing lunches is my son hearing from other kids that he has a “weird lunch” because it’s not a Lunchable or a typical sandwich. 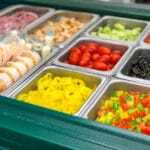 We’ve had many conversations about eating healthy and why we eat what we eat, but how do you arm your kids to face the criticism in the cafeteria? And the winner is….Sally! (No relation to me of course!) Random.org has chosen you as the winner of the cookbook and stainless steel containers, and I will be emailing you with the details. Thank you to everyone who entered.